I knit a lot of things for my mum over the years, and I’ve been stunned to discover that she kept them all. Every bit of it (with the exception of slippers that wore out) are still in her closets and drawers. She’s got a fantastic sock collection, and hats, sweaters and tops. Erin took a few of the sweaters, and the silk tee that I knit her, and I think I’ll take the socks back – I’m not sure yet. Socks are such an intimate thing, I don’t know if I can bear to let them go, or bear to have them here. There’s a lot to figure out and I hadn’t expected it to come down to weeping into old socks, but there you have it. In her cupboard of sweaters, I found an old one. This was the first sweater I knit my mother, and frankly, it doesn’t have much to recommend it. For a while with my mum, there was a sheep thing. It’s hard to explain, but she ended up with a lot of sheep stuff, and at the beginning of all of it, I knit her a sweater that was supposed to be reminiscent of her grandfathers sheep farm in BC. 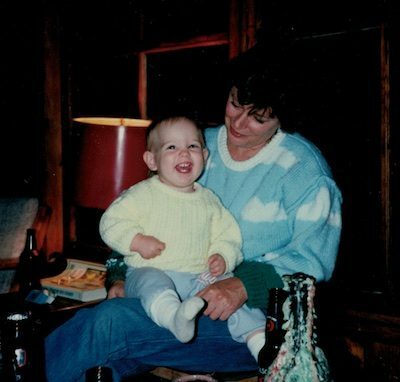 It was 1990, and at the time I was very young and broke, and Amanda was six months old, and the outlay of cash for the yarn was a big deal, even though it’s absolutely acrylic. (Canadiana, ordered from Mary Maxim. I remember it coming in the mail.) 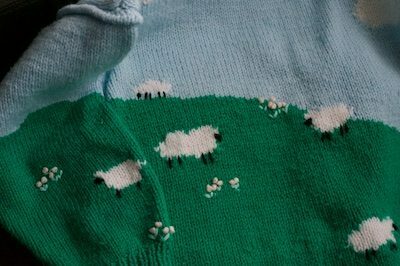 I designed it myself, such as it is, a little square, drop-sleeve sweater, and charted the intarsia sheep and hills and clouds, and embroidered on the little bunches of flowers and the legs and noses of the sheep. I remember making it. I remember hoping she liked it, and I remember being worried because the clouds didn’t look quite right, and the seams aren’t perfect, and the green wasn’t quite the green I thought it would be. All those things are still true. It’s not the most expertly executed knitwear, my skills are very different now, that’s for sure. I remember her opening it, and I remember her saying that she loved it. I don’t know if she really did. I mean, now that I’m a mother I see that she certainly did love it, but we’ll never know if she loved it because of what it was, or because I made it for her. The stuff your kids make is like that, and I suspect it doesn’t change because they grow up. She wore that sweater for years. Years and years. It smells like her (and like soap) and right now it’s in my living room, and I have no idea what I’m going to do with it, and I can’t even explain my feelings toward it, but I knew it couldn’t go to Goodwill. 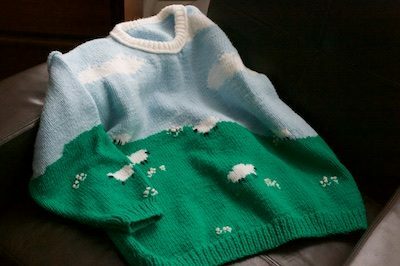 I now own a pretty crappy acrylic sweater, one that I’m super attached to, and rather ironically, it was knit by me. Couldn’t have predicted that. By the way, we’ve opened our April Retreat up for Registration, there’s some info here if you would care to join us. Who knows. Maybe I’ll wear the sweater.